Stacy B. Schaefer is professor emeritus of anthropology at California State University, Chico, and has worked in research and education at a number of California museums. Schaefer has a long-standing interest in Mexico, with particular interest in the Huichol Indians. She is the author of To Think With a Good Heart: Wixarika Women, Weavers, and Shamans (University of Utah Press, 2002) and the co-editor, with Peter Furst, of People of the Peyote: Huichol Indian History, Religion, and Survival (University of New Mexico, 1997). 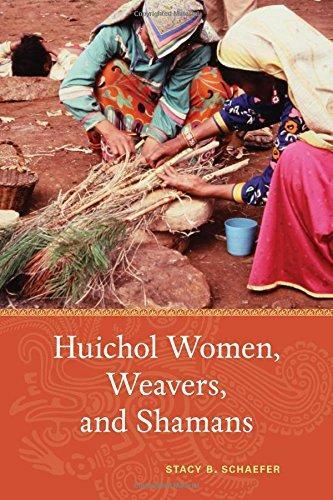 The unique aspect of this book is that the author not only lived among the Huichol for extended periods of time over two decades, but committed herself to a long apprenticeship to become a weaver. Schaefer’s account is a masterful interweaving of personal experiences and ethnographic research. Her interest in weaving enabled her to become a trusted member of the community, affording her valuable insights into their lives, beliefs and customs. The book considers the significance of weaving in relation to every aspect of Huichol life, from food gathering and farming to pregnancy, birth, shrines and goddesses. Schaeffer’s eventual success in becoming a master weaver opened yet more doors into the community, with fresh insights into local shamanism. Schaeffer lived experiences that most of us can only hope to read about. Fortunately, her descriptions are captivating and detailed, as, for example, when she writes about her trip accompanying Huichol “family” on their pilgrimage to collect sacred peyote cactus. While this is an academic work, Stacy Schaefer does an outstanding job in explaining all this in a way which is easily accessible to the general reader. Schaefer also wrote Amada’s Blessings from the Peyote Gardens of South Texas (University of New Mexico, 2015), which tells the story (based on 13 years of fieldwork) of Amada Cardenas, a Mexican-American woman, and her pivotal role in the little-known history of the peyote trade, which began in the 1930s.